If Granger is going to be out for a while, why cant they declare Nagamootoo as Acting President? Prime Minister Moses Nagamootoo and Opposition Leader Bharrat Jagdeo. As the National Assembly prepares to vote on 2019 national budgetary allocations from next Monday, Prime Minister Moses Nagamootoo rejected Opposition Leader Bharrat Jagdeo’s position that he has vacate his seat in the House because he is performing presidential duties. President David Granger left Tuesday for more chemotherapy in Cuba and was expected to return to Guyana this weekend. The Prime Minister accused the Opposition Leader of attempting to create “division” to derail passage of the budget and force a government shutdown. “The deviousness is what we see playing out, that he would try to first divide members of this government and set us up against each other and then when you believe, as a throw-back, as a fall-back, you are now asking for the removal from the House of the Prime Minister because the intention is to defeat the budget….to lock down the government, to create a constitutional crisis and to breathe disaffection and rebellion among the people of this country,” he said. 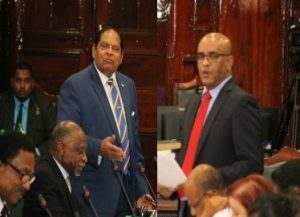 Nagamootoo argued that Guyana’s Constitution provides for the Prime Minister to be Leader of government’s business in the House, first Vice President and principal assistant to the President. He said the President, in or out of Guyana, could authorise the Prime Minister to carry out “certain functions”, “any functions” while keeping his appointment intact. Contributing to the budget debate, Jagdeo said the Prime Minister is “squatting” in the 65-seat National Assembly where the governing coalition has a one-seat majority. The Opposition Leader reasoned that the constitution states that when a minister is performing presidential duties or has assumed the office, his or her seat in the National Assembly should be regarded as vacant and the should be temporarily filled until the period expires. He noted that the constitution provides for the president’s absent from Guyana due to illness or any other cause, he or she can direct authorise any Cabinet member to perform presidential functions. “We have had this Prime Minister come here over and over when he is acting as President in violation of our constitution, squatting in the Parliament contrary to the practice of the past and we have allowed this to happen. We plan, Mr. Speaker, to raise this on Monday when we come to consider the estimates. His presence will not be missed in the House,” Jagdeo said. Then Prime Minister Samuel Hinds had participated in sittings of the National Assembly while performing duties of the President. Earlier, the Opposition Leader announced that he would inform House Speaker, Dr. Barton Scotland that government parliamentarians have received threats, including against their lives, if any of them vote in favour of the opposition-sponsored no-confidence motion. However, the Prime Minister denied Jagdeo’s claim. “It is only a diabolical mind will conjure up things of that kind against Honourable members of this House and to impute that because there was a motion of no-confidence tabled in this House that attempts would be made to deal with members of the government side who dare support such an unpopular motion,” he said.